If I’m watching a movie where the characters keep messing with each others’ minds, I should be enjoying the experience of having my own mind messed with. I appreciate a movie that can fool me. I’m always trying to outguess them, either solving the mystery halfway through or even predicting a gag here and there. So the first time through movies like Sleuth or The Usual Suspects or The Last of Sheila are a great joy – because there’s nothing I respect more than the movie that can fool me. Granted, Sleuth & Sheila fooled me when I was a kid and Usual Suspects almost fooled me… yeah, that’s right. There’s a very strong tell about halfway through the movie. Sometimes the tell can be the casting, if you’re up on the inside jokes. That’s what gave away Dead Again to me. 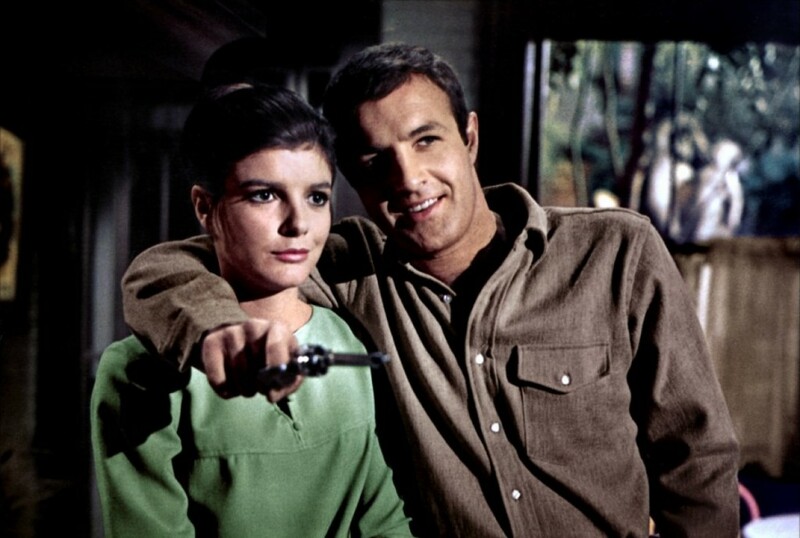 Games (1967) stars James Caan and Katherine Ross as a rich young art collecting NYC couple who enjoy playing scary practical jokes on people. Simone Signoret inserts herself into their lives and joins in. And then these punkings continue until they get very much out of hand, involving the murder of a creepy grocery boy (Don Stroud), paranoia and the occult. BUT as with Dead Again, I figured the ending because of the tell. Still not a bad film about no one trusting each other. The one thing that made me doubt the (correct) solution I’d figured about halfway in was a lack of what I felt was a reasonable motive. When the motive was revealed, it still really didn’t add up. I can’t say more without major spoilers, sorry. Well, maybe one major spoiler for anyone who remembers Simone Signoret in the wonderful French film Diabolique. Actually, just making the connection is spoiler enough. Also – an excellent TV remake of Dialbolique starring Joan Hackett, Tuesday Weld (in the Signoret role) and Sam Waterson is on youtube. Reflections of Murder, directed by John Badham. Thumbs up! Onwards to a very relaxed & realistic Cold War spy drama, a purposeful flipside to the gadget-and-superheroesque Bond/Flint/Matt Helm type stuff filling screens around the same time – The Quiller Memorandum from 1966 features George Segal as an American operative put to work by Alex Guinness in West Berlin to smoke out a nest o’Nazis led by Max Von Sydow while getting involved with eye candy Senta Berger. The striking thing in this one is just how bad Segal is at his job – he gets captured easily, finds himself at the mercy of his enemies repeatedly, and totally misreads the people around him, both friend and foe. The pacing is slow, deliberately, and the affect of everyone is extremely methodical and calm. The screenplay by Harold Pinter is terse, intelligent and direct. I’m so used to seeing Segal in comedy that he seemed miscast, although that makes him the perfect spy, I guess. No one would suspect him. This one sits on the Cold War spy movie scale as less depressing than The Spy Who Came In From The Cold and certainly less ridiculous and silly than ANY of the Bond movies. It’s also better than the Harry Palmer series, since it manages to depict the tedium of intelligence work without taking the self-hatred of the main character so far as to make the audience wonder why they should care either. The cast is great, as well as some wonderful locations in West Berlin used well. And while not approaching the total paranoid nihilism of 1970s spy thrillers like Three Days Of The Condor, Quiller creates a similar cynical atmosphere where our central character really can’t trust anyone around him. So a thumbs up to Quiller, and a meh to Games, I guess.